Note: Originally posted on the "Anime Archivist" blog in December 2012. One thing I wanted to do with my old blog but never got around to was to write about anime and tokusatsu DVDs that were practically ignored by western fandom. The majority of these releases are non R1 (US and Canadian releases) discs, though there a number of US releases which never got much exposure and languished in obscurity. Some of these titles are unappreciated classics, some are guilty pleasures and some are downright hideous. However I believe all of them should have been noticed a bit more than what they were. 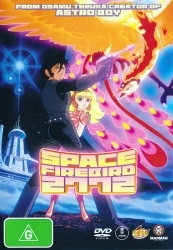 First up is a relatively obscure English dubbed and subtitled Australian release of Osamu Tezuka's “Space Firebird 2772”. Until recent times, anime releases in Australia have pretty much been dupes of either UK or US releases. As the US industry began to falter a few years back, and with the re-emergence of Siren Visual as a serious competitor in the anime market, a trickle of English anime releases that hadn’t previously had US or UK releases began to filter through. This is one of the first, and content wise, it was quite amazing that it even got released in the first place. Seriously, a (then) 25 year old anime film which veers strangely from very serious drama to rather odd Disney-like musical interludes? And in a tiny video market like Australia? So why did this title get a DVD release? The most likely reason was at the time Madman was releasing number of old anime by the God of manga, Osamu Tezuka, such as the 1960’s and 1980’s versions of “Astroboy” and “Kimba the White Lion”. I suppose it was a natural progression for Madman to seek out other Tezuka material. They must have thought they lucked out with this film which came with a pre-existing English dub, pretty much a prerequisite for any Madman anime release. One can only imagine the rights for the film were also quite cheap. This film is loosely based the “Future” arc of Tezuka’s long running but incomplete “Phoenix” manga. In a far off future, Earth is dying. Mankind now reproduces by way of test tube babies, grown outside the womb in glass containers. From birth to adulthood children are raised in separate rooms, and their destiny, in other words their future career, has already decided. Godoh is one of these children. We see him being raised into adolescence when a large container is delivered to him. Inside is a female robot called Olga who has the ability to change into several forms of transport. Unlike the cold unfeeling computer that raised him up to this point, Olga is warm and caring. When reaching full maturity, he is contacted by a man named Rock Schlock, the Chief of Science, who orders him to the Science Centre for additional training as a pilot/hunter. However when he reaches the centre, his trainer, Boon, orders Olga off the premises as she is a robot. The training is hard and cruel, including the killing of animals, however Godoh comes out on top in his class. His skills catch the attention of Rock who proposes a special mission. He is to capture Cosmozone 2772, a bird like creature that roams the vacuum of space whose blood can bring Earth back to life. The mission is extremely dangerous; two missions have already ended in failure with the deaths of both crews on board. In return for taking on this mission, Godoh asks that he be able to move freely beyond the city for a day. Rock grants this request. Godoh uses this opportunity to go out beyond the city limit to a beach with Olga. There he spots something in the distance. Olga flies off to investigate and returns with a flower. The two of them have discovered the flower garden where the elite of society, “the Elders”, live. There Godoh meets Lena. Though it is forbidden because they are from two different classes, the two of them start seeing each other. One night a patrol spots Godoh in the garden with Lena. The two of them flee in an air car, but after a long chase which ends in them crashing their car, Godoh is taken away to be sentenced. Olga along with Lena’s alien servant, Pincho, hide in the wreck of the car and escape when the coast is clear. Rock, destined to be married to Lena, takes away Godoh’s citizenship and sends him to Iceland to endure hard labour on the mantle energy project, which is designed to harness geothermal energy as solution to Earth’s energy problems. There Godoh is befriended by a fellow inmate and scientist, Dr Salta, who asks him to escape and search after Cosmozone 2772, the Phoenix, which its blood is said to be able to revitalise the Earth. But derailing their breakout plan is an earthquake. It in turn destroys the turbine plant which spills millions of litres of scalding hot water in the direction of the prisoners. However Godoh is saved by Olga who has just inadvertently heard where he was being held after ruining Rock and Lena’s wedding (with the help of Pincho). That night Dr Salta decides to escape by stealing the spaceship, Space Shark, which is docked at the prison. But the breakout doesn’t go to plan and Dr Salta, Godoh, Olga and Pincho are cornered by Blackjack, the prison’s warden. Blackjack makes a deal; if Godo wins a fist fight against him, Godoh gets his freedom. If he loses he will receive the harshest labour in the prison. Unbeknownst to Gotoh, Blackjack sympathises with the group and takes a fall. Soon there are on their way to the planet Tear in the Antares system. Dr Salta’s friend, Van, lives there and apparently knows where the Phoenix is. After misunderstanding them and leading them to a different creature, Van leads them to a small dice like creature called Crack who knows a strange green blobby creature called Pooks. Through Crack, Pooks leads them to a creator filled planet. There they find the mysterious “Cosmozone 2772”, which turns out to be a huge Phoenix several times larger than their spacecraft. They soon discover that the creature is pretty much impossible to capture and quickly find themselves on the end of its attacks, which prove to be fatal. This version of “Phoenix” was apparently created in response to the failure of Tezuka’s 1978 live action “Firebird: Daybreak Chapter”. Like that film, this animated version is far too ambitious for its own good. I’ve always found much of Tezuka’s animated output rather problematic. I do like many of his short experimental films, the 1980 remake of “Astoboy” (which was a personal childhood favourite), “Blackjack” OVAs and most of the adaptations of “Jungle Emperor”. But often I find there are just far too many ideas in his animated works and more often than not it becomes a jumbled mess. “Phoenix 2772” is no different. There’s a number of competing ideas in the film. Most noteworthy is the animation itself. Typically Japanese animation is divided up into separate “cuts” (shots) and an animator does that particular shot. 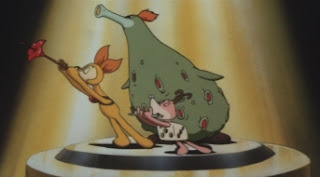 But in this film, Tezuka used the Disney model for most of the film’s animation, where an animator was assigned a character and they were responsible for only animating that character for the entire film. Whether or not there is any noticeable difference in comparison to a normal anime film with a film with this kind of budget (reportedly several million dollars), is debatable at best. Other animation techniques are more apparent, such as filming a model of the Space Shark and then rotoscoping the film onto animation paper. There’s also the stunning single continuous shot of journey from Gotoh’s living quarters to the Science Centre at the beginning of the film. The camera pans up from Olga and Gotoh travelling in their air car and flies above the highway and city and then eventually comes back down again as he car arrives at its destination. This part of the film comes right at the end of a ten minute sequence introducing the Phoenix and showing Gotoh’s childhood. There isn’t a single word spoken in that time. Yep, no dialogue at all for the first ten minutes of the film. That’s some really ballsy film making there. Other animation techniques come up a little bit short. Such as animating some sections at 24 frames per second rather than it the usual 8 used in most anime productions. In some sequences for some characters, such as Olga, the entire character, head to toe, is animated with individual hand drawn frames at 24 frames per second giving the character a “wobbly” look. As I understand it, this was done to show that characters had humanity and were alive. In Olga’s case, it was to show she was becoming more human. However this technique is a little too subtle and is inconsistently applied. It’s no secret that Tezuka was highly influenced by Disney and also the cartoons of Max Fleischer. This can be clearly seen in an early scene inside the prison as we see the silhouettes of the prisoners working. Tezuka also has this annoying habit of using really cutesy moments in his animated projects, which often threaten to throw the entire story off balance. Case in point; the two musical sequences featuring Pincho. They really feel out of place considering how dark the story can be. There are also some really inappropriately cartoonish moments such as Boon’s eyes comically bulging out as he taunts Gotoh. A lot of these moments seem to be there for no apparent reason other than Tezuka wanted them there. As a result, sometimes the film does feels just a bit self-indulgent. The script, co-written by director Taku Sugiyama and Tezuka himself is also a bit of a mess. Certainly the overall plot is really quite intriguing. It’s partly a retelling of Pinocchio with bits of Aldous Huxley’s “Brave New World” thrown in, wrapped around Buddhist philosophies regarding reincarnation. And to top it all off, at its core it’s also a love story and an environmental parable. But the addition of really cutesy characters such as Crack and Pooks and other rather odd elements such as the musical interludes derail the story to a large degree. I also think there is way too much plot to fit in a two hour film. Certainly a number of plot elements such as Olga’s jealousy over Lena and Gotoh’s relationship, are not explored adequately enough. The film could have done with some trimming and discarding of some minor plot points. Like most of his other works, Tezuka’s “star system” was in full swing in this film. 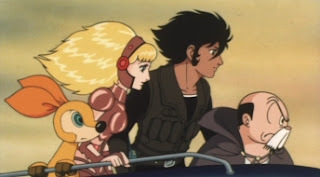 Characters used in previous works here include Rock, Saruta, Shunsuke Ban (or Higeoyagi, subtitled on the DVD as “Van”), Boon, Blackjack, and Acetylene Lamp who has a small cameo. The film has had a really tortured English language release over the years. Dubbed rather badly by Toho themselves via a Hong Kong studio, this version of the film first appeared on video in the UK around 1982. The film was latter cut down to less than 80 minutes for a US “kid vid” release in 1987. Madman’s DVD retains the uncut dub, which is stilted at best and due to its age sounds quite muffled when compared to the Japanese mono track. The subtitles on the disc are also Toho’s creation. While they aren’t bad, at times they do omit some of the secondary dialogue, though nothing really important is left untranslated. Some of translations of the character’s names are questionable such as “Van” instead of the more correct “Ban”. Despite some very minor NTSC to PAL conversion issues, the 16:9 anamorphic video on this DVD looks quite good for a 30 year old film. The only real extra on this disc is the original Japanese theatrical trailer. Overall this is a hard film to recommend to others. The story is quite epic, the animation, especially in the first half of the film, is stunning, but the film seems to lose its way around the half way mark. 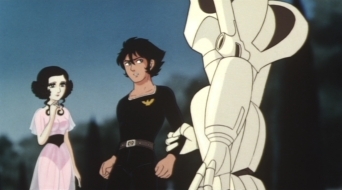 There are too many ideas, both in terms of story and visual techniques, that Tezuka has attempted to cram into its two hour runtime. It really feels like a flawed masterpiece, a missed opportunity. Don’t let the “G” rating fool you. This film really isn’t suitable for young children. Apart from including some animal and human death (albeit sanitised), many of these themes presented in the film would be difficult for young children to understand. Anime fans interested in films from the 1970’s and very early 1980’s, as well as fans who are interested in the history of general animation, would most likely enjoy this film. As for current availability, this is an out of print Australian DVD, and therefore is a bit hard to find in the secondary market, even for those living in Australia like myself. I have not seen a copy for sale on eBay since I originally wrote this review in 2012.